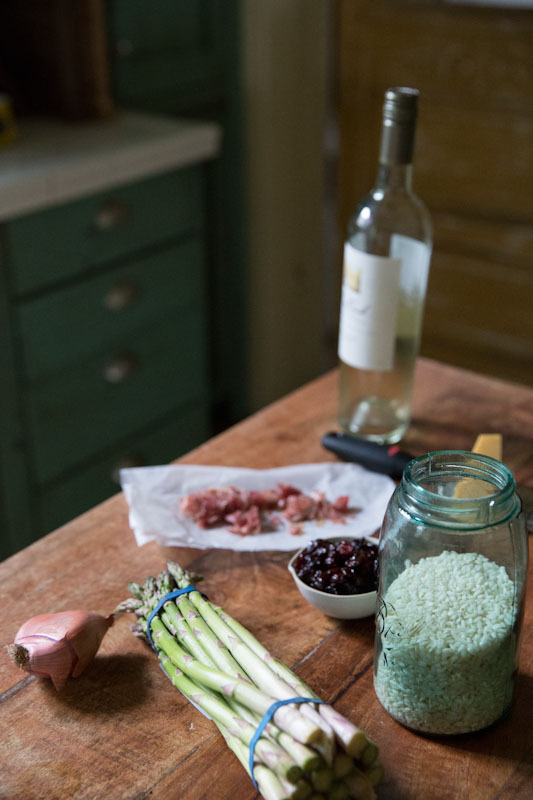 Every spring we make this risotto with bright green asparagus and tart sun dried cherries. After having a similar dish at a little cafe in Park City years ago, we’ve been recreating it for our dinner table. Several friends have asked for the recipe and I kept meaning to put it on the blog but honestly, risotto is best enjoyed right from the stove top, no time for photos. This is a meal we’ve made for friends time and time again and never took the time to create a real ‘recipe’ for. 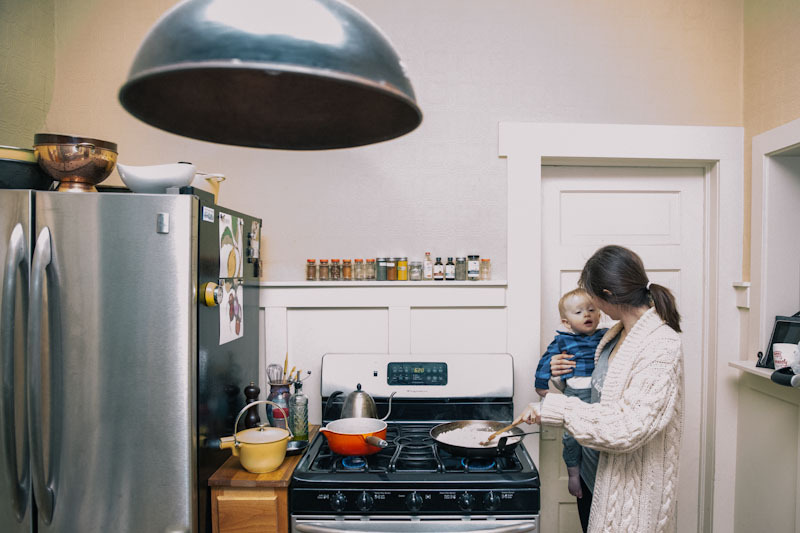 You know… one of those recipes that it’s just a’little bit of that and a dash of that.’ So, this time we just made the dish for our little family and tried to capture the steps of one of our favorite family meals. While we did manage to create a recipe that we love, I will also tell you that this is one you can and should feel free to alter. Don’t like asparagus, that’s fine, use another veggie. 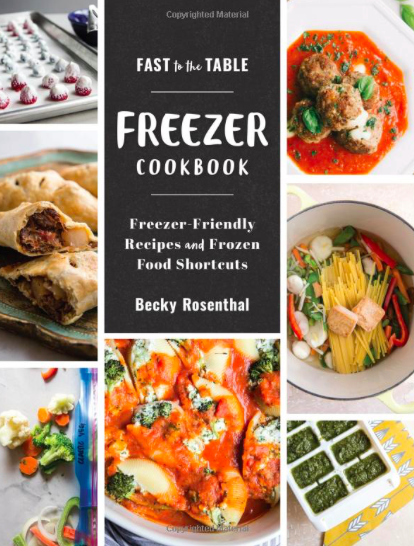 If you want to go meat-less, that’s cool too, and it will still taste lovely! The basic needs for a really good risotto are arborio rice (risotto rice), two shallots, vegetable or chicken stock, white wine, and parmesan cheese. The variables- asparagus, sun-dried cherries, smoked or rotisserie chicken, and proscuitto. Risotto is really quite easy. I had a lady stop my mother and law and I once as we were buying risotto rice and say, “You know making risotto is really hard.” I may have made a snide comment back, but honestly, it’s not really hard. Once you make it a couple of times you’ll have it down. And I’ll tell you the secret… stir, stir and stir some more. Turn on the kitchen tunes, and get ready to stir for 20-3o minutes. Baby resting on your hip – optional. But I will say this is an easy recipe to make if you do have a little one. 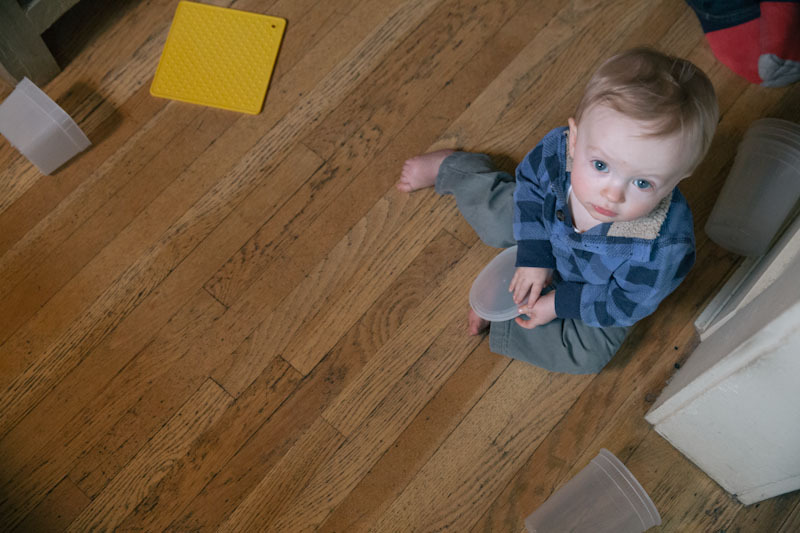 And if, your little one, like mine, gets tired of stirring, tupperware on the floor should do the trick until the stirring is complete. Like I mentioned before, risotto is best enjoyed right when it’s ready. And how do you know it’s ready – it should be slightly al-dente but when you smash one of the grains with a wooden spoon it should smash completely. And if you run your spatula through the risotto, the risotto flow slowly to fill in the space. As the Italians say, risotto should be like “la onda,” a wave that slowly rolls to shore. A few more risotto tips – have all of your ingredients out and ready to go before starting, toast the rice in butter or oil before adding broth, keep the broth warm in a separate pot as you add it into the rice, add the broth slowly (about 1/4 cup at a time), pancetta is great for boosting flavor, and rotisserie chicken make a great easy protein addition if you want the dish to be more substantial, and right before serving, finish the dish with butter, white and Parmesan. Also, sometimes I wait until just before my friends arrive to start stirring in the broth, that way they can enjoy some appetizers and drinks before we dip into the main course. Remember, risotto waits for no one and is perfect the second it’s done. Now you have all my secrets. Risotto makes a fabulous dinner party meal, that’s done in less than 30 minutes start to finish and impressive and enjoyable to everyone at the table. 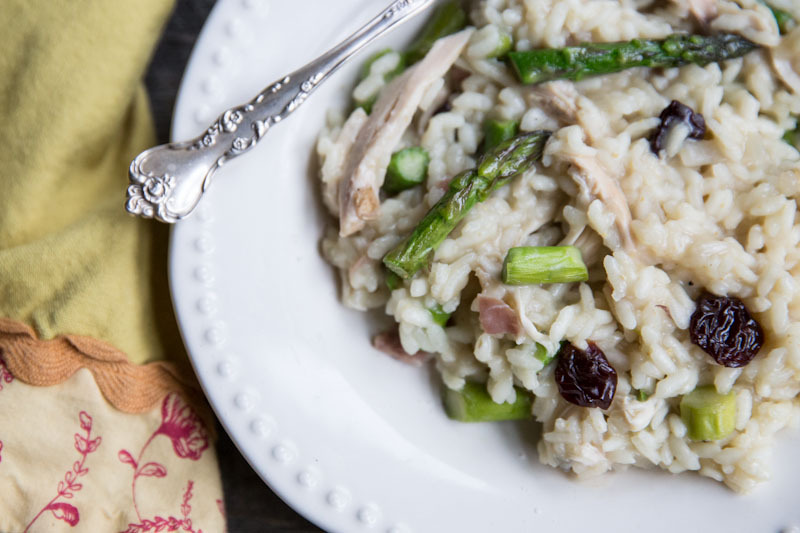 Perfect Spring-time risotto with asparagus and sun-dried cherries. Chop the asparagus into short pieces, about 1/2 inch, leaving the tips whole. In a large saute pan, saute the asparagus in 1 tablespoon of olive oil for about 5 minutes. Season with a little salt then transfer to a bowl. In a separate pot, heat up the broth. Add another tablespoon of oil to the same pan used for the asparagus and add in shallots. Cook for just a couple minutes on medium heat then add in rice. Toast the rice with the shallot for a couple of minutes. Add in the wihite wine and scrape up any browning from the bottom of the pan. Let 1/2 of the wine evaporate as you stir. Then, start adding in hot broth 1/4 cup at a time. Use a wooden spoon to continually stir. Add in more broth once it is almost all absorbed. Continue to stir and add in broth. This gradual addition of liquid is key to getting the rice to release its starch and create its own delicious sauce, so don't rush this step. Ideally, you want to use just enough broth to cook the rice and no more. Begin tasting the rice after about 12 minutes to gauge how far it has cooked. Add salt and other seasonings as needed. The risotto is ready when the rice is al dente (when it still has a bit of chew) and the dish has the consistency of thick porridge. If you run your spoon through the risotto, the risotto flow slowly to fill in the space. As the Italians say, risotto should be like "la onda," a wave that slowly rolls to shore. 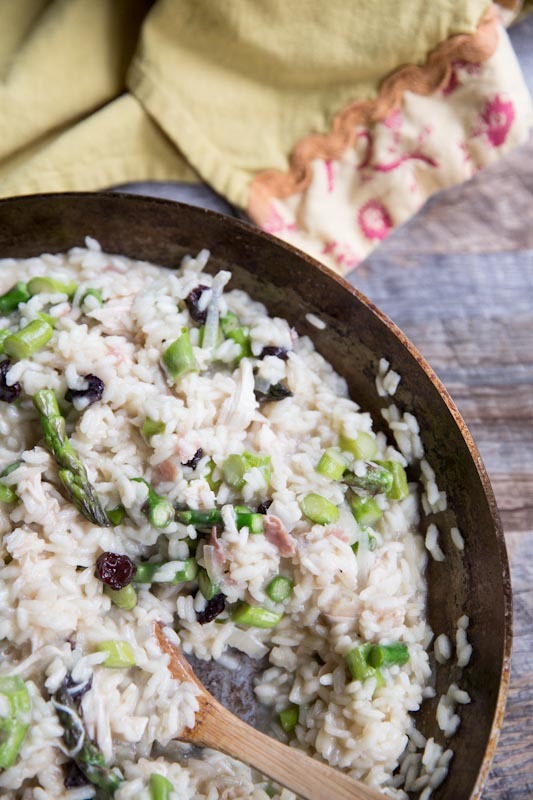 Stir in the asparagus, cooked chicken, proscuitto, and sun dried cherries. Season with salt and pepper to taste. Finish the risotto with 1 tablespoon of butter (I usually start with olive oil then finish with butter so you can enjoy the buttery flavor), and 3/4 cup parmesan. Serve with additional parmesan. Enjoy with a green salad and white wine. Love this post so much! Great tips and photos, especially the one of you and Everett. Risotto is one of my favorite dishes! Ah, risotto! One of my very favorite dishes. I can’t wait to try this. We have dried tart cherries and arborio rice in the pantry. I agree with Annalise–love that photo of you and Everett! Thanks friend:) He’s my cooking side kick. Yes, thank you for sharing this. I sometimes forget what an easy supper risotto can make! True! No one ever thinks of risotto as an easy weeknight meal but it really can be! This is absolutely beautiful – I’m absolutely in love with all the spring asparagus. I have everything I will have to make it ASAP! Thanks Megan! Great to hear from you!! 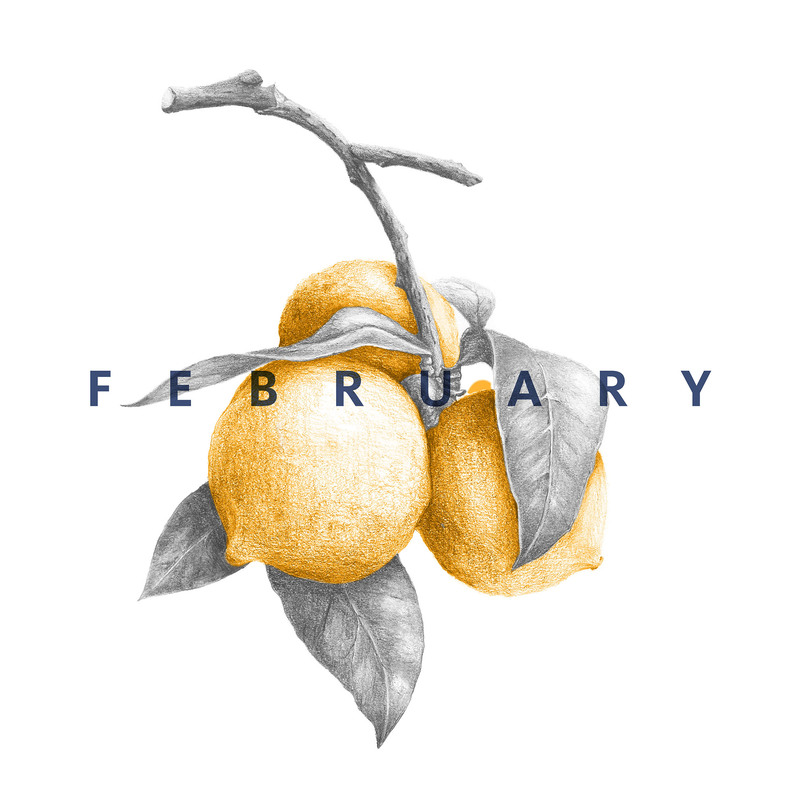 Note To Self: stop reading this blog on an empty stomach…it makes you ridiculously hungry for good food that you don’t have in your fridge. 🙂 your comment made me laugh!! Hope you find something yummy for lunch today! Thank you for recreating and posting this recipe! I moved back to CA after 4 years in Utah. During that time, I made many trips to Park City JUST for this dish! 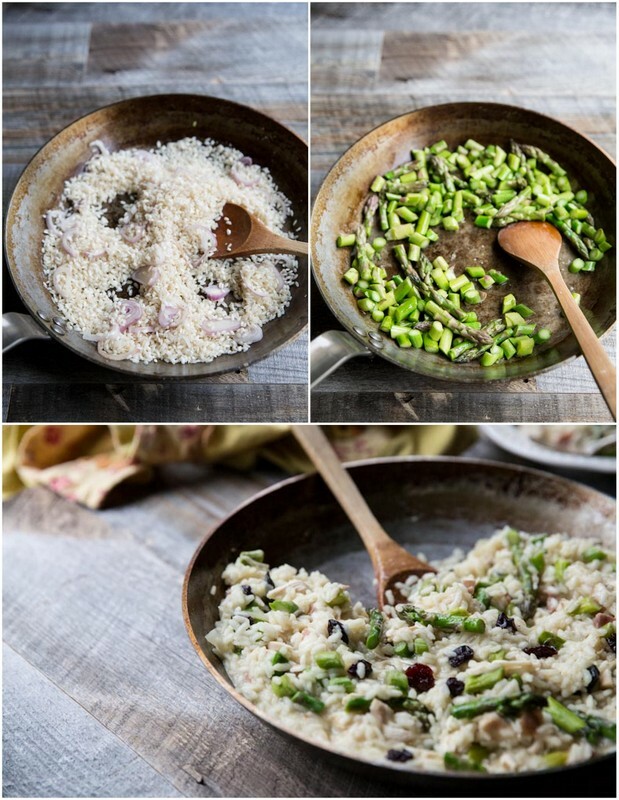 This risotto looks fantastic – my family loves rice so I’m always looking for new recipes. I love that you included the photos of your son. He is precious. My cousin has a two year old son, whom he also named Everett, so this reminds me of them. So sweet!! I don’t know many Everetts so it’s fun to hear of another. And I hope your family enjoys this dish as much as we do!